Streets Alive Mission has walked with a young woman for a long time. She has experienced multiple successes and we are so proud of her. One of those successes led to an unforeseen and exciting, but expensive challenge. She was accepted to college, but with no way to pay for it. 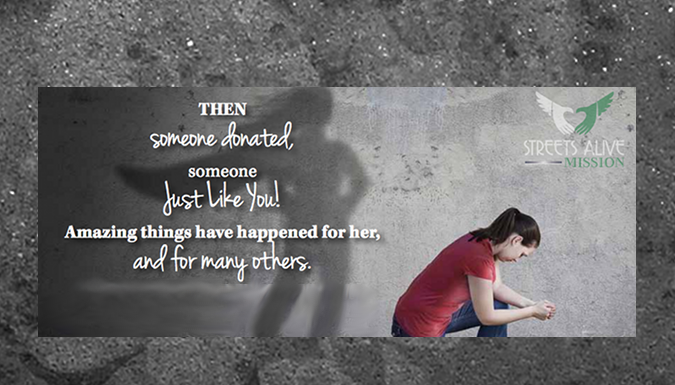 THEN someone donated, someone Just Like You! Amazing things have happened for her, and for many others in Lethbridge. Open the newsletter – Spring 2016 NewsÂ (pdf**) – to read about another success. Your donation makes a real difference in the lives of REAL people! Â Donate today. With the frequent increases in postage, we find our communication costs steadily rising. We also realize that for many people, email is a much preferred method of communication. With these factors in mind, Streets Alive Mission is developing an e-newsletter that will hopefully be available beginning in January 2016. If you would like to receive future newsletters via email, please subscribe to our Streets Alive Mission Newsletter below. We respect your privacy and adhere to the Canadian Anti-Spam Legislation to protect your information, and you can easily unsubscribe at any time. If you can’t see this subscription option in your email, click Spring 2016Â NewsletterÂ to visit this page on the site directly. Thank you to those of you who have already subscribed. We appreciate it greatly! **You will need Adobe Acrobat Reader to view the newsletter and insert linked above. If you do not have Adobe Reader click here to download free!